The entity form contains relationships to webpages and additional properties to control the initialization of the form within the portal. The relationship to webpages allows dynamic retrieval of the form definition for a given page node within the website. To view existing entity forms or to create new entity forms, go to Portals > Entity Forms. When creating a new entity form, the first step is to decide the Entity and Form Name that you will be rendering, in addition to the mode: Insert, Edit, or Read Only. The mode selected will determine if you are creating a new record from the portal, editing an existing record, or just displaying information about a record on the portal. An Entity Form must be associated with a webpage for a given website for the form to be viewable within the site. The Connection entity subgrids are not supported in entity forms. If you add a Connection entity subgrid to the form using Form designer, error messages are displayed when you render the form on the portal and use the Connection entity. Duplicate fields, multi-select option set, custom controls, and business rules are not supported in entity forms. If you create an entity form in the Insert mode, you can't change a button's alignment or place an action button above the entity form. If you render a lookup control as a dropdown list on the form, the related records filter does not work. The webpages associated with the entity form can be viewed by selecting the Web Pages link listed in the Related navigation links in the leftmost menu. When creating or editing a webpage, an Entity Form can be specified in the lookup field provided on the Web Page form. The various master pages used by the portal found in the Dynamics 365 for Customer Engagement portal installation directory contain declarations of the EntityForm server control. When rendering the webpage containing either the Page (~/Pages/Page.aspx) page template or Full Page (~/Pages/FullPage.aspx) page template, the controls will determine whether the entity form lookup contains a value, in which case the form will be rendered. To secure your forms, you must create entity permissions that determine access and ownership of the records in Dynamics 365 for Customer Engagement according to web roles. If a user lands on an entity form and does not have permissions, they will receive an error message. To enable permissions for an entity form, set Enable Entity Permissions to true. More information: Create web roles for portals. Name The descriptive name of the record. This field is required. Entity Name The name of the entity from which the form will be loaded from. This field is required. Form Name The name of the Form on the target entity that is to be rendered. This field is required. 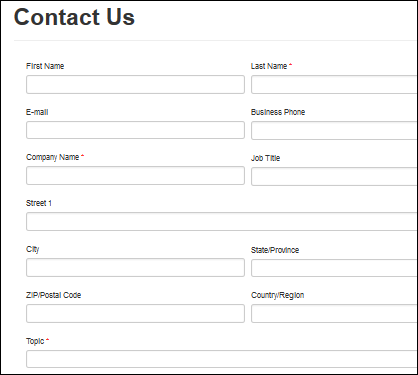 Tab Name Optional name of a Tab on a Form for a specified entity that is to be rendered. Selecting Insert indicates the form should insert a new record upon submission. Specifying Edit indicates the form should edit an existing record. Selecting ReadOnly indicates the form should display an existing record’s non editable form. Edit and ReadOnly requires that a source record exist and parameters specified in the 'Record Source Type' and 'Record ID Query String Parameter Name' fields to select the appropriate record when the form is loaded in the portal. Selecting Query String requires a parameter name that must be provided in the query string of the URL to the form. This can be specified in the 'Record ID Query String Parameter Name' field. Selecting Current Portal User will retrieve the portal user record for the current authenticated user. Selecting Record Associated to Current Portal User will retrieve the portal user record for the current authenticated user and then retrieve the record for the given relationship as specified by the 'Relationship Name' field. Record ID Query String Parameter Name A parameter name provided in the query string of the URL to the Web Page containing this Entity Form. Relationship Name Required when Record Source Type is Record Associated to Current Portal User. The logical name of the relationship between the current portal user record and the target record. This must return the same entity type specified by the Entity Name field. Allow Create If Null An optional boolean value available when Record Source Type is Record Associated to Current Portal User. Indicates that if the related record does not exist, allow the user to create it the first time, otherwise an exception will be thrown if the record does not already exist as the form needs a record to data bind to. Enable Entity Permissions Will Cause the form to respect Entity Permissions. The default is false for backwards compatibility reasons. If set to true, explicit permissions are REQUIRED for any user wanting to access the form. Show Captcha for Authenticated users Displays captcha for authenticated users. Validation Group The group name assigned to input controls for evaluating valid input of named groups. Auto Generate Steps From Tabs Indicates that multiple tabs on an entity form will be displayed with each tab as a sequential step starting with the first tab and continue until all tabs have been navigated to and upon final submission a record is inserted. By default, it is not selected. The default value indicates that only one tab or form is to be rendered for the current step. If the Tab Name is not specified, then the first tab is displayed. Render Web Resources Inline Eliminates the iframe that encompasses a web resource in an entity form. ToolTips Enabled The tooltip is set using the description of the attribute on the target entity. Show Unsupported Fields All fields are currently supported. This is reserved for potential changes Dynamics 365 may make to field types. Set Recommended Fields as Required Makes all attributes required that have the field requirement level set to 'Business Recommended'. Make All Fields Required Makes all fields required regardless of the field requirement level. Enable Validation Summary Links A boolean value of true or false that indicates whether anchor links should be rendered in the validation summary to scroll to the field containing an error. Default value is true. Validation Summary Link Text The label assigned to the validation summary links. Default value is 'click here'. Validation Summary Header Text The label assigned to the validation summary header. Instructions Instructions to work with the form. Record Not Found Message Message to be displayed when a record is not found. Hide Form on Success Requires On Success set to Display Success Message. When selected, the form is hidden upon successful submission of the form. Success Message Requires On Success set to Display Success Message. The message displayed to the user upon successful submission. If one is not specified a default message (Submission completed successfully") will be displayed. For each language pack installed and enabled for the organization a field will be available to enter the message in the associated language. Append Existing Query String Requires On Success set to Redirect. When selected, the existing query string parameters will be added to the target URL prior to redirection. Append Record ID To Query String Requires On Success set to Redirect. When selected, the ID of the record created is appended to the query string of the URL being redirected to. Associate Current Portal User Indicates the currently logged in user’s record should be associated with the target entity record. Target Entity Portal User Lookup Attribute The logical name of the attribute on the target entity that stores the portal user. Is Activity Party Boolean value indicating whether or not the Target Entity Portal User Lookup Attribute is an Activity Party type. Attach File Check to have the form include a file upload control to the bottom of the form to allow a file to be attached to the record. Attach File Storage Location Options: Note Attachment, Azure Blob Storage. If your organization is configured to use Azure Storage, you can choose to storage uploaded files for this Entity Form there. Otherwise, files with be stored as Note Attachments. Allow Multiple Files Boolean value indicating whether or not the user can upload more than one file. Accept The accept attribute specifies the MIME types of files that the server accepts through file upload. To specify more than one value, separate the values with a comma (e.g. audio/,video/,image/*). Label The text displayed next to the file upload control. For each language pack installed and enabled for the organization a field will be available to enter the message in the associated language. Attach File Required Makes the attachment of a file required to proceed. Required Error Message The message displayed during form validation if Is Required is true and the user has not attached a file. For each language pack installed and enabled for the organization a field will be available to enter the message in the associated language. Restrict Files to Accepted Types Forces validation on the Accept field. If not selected, the Accept attribute will only be used as a suggestion for the file upload dialog. File Type Error Message The message displayed during form validation if Restrict Files to Accepted Types is true and the user has attempted to upload an invalid file type. For each language pack installed and enabled for the organization a field will be available to enter the message in the associated language. Maximum File Size (in kilobytes) Forces validation on the maximum allowed size of the uploaded file. File Size Error Message The message displayed during form validation if Maximum File Size (in kilobytes) is true and the user has attempted to upload a file that is too large. For each language pack installed and enabled for the organization a field will be available to enter the message in the associated language. The following parameters pertain to setting an entity reference when the form is saved. This provides a way to associate the current record being created or updated by the form with another target record. This is useful if you have multiple steps with multiple entity types and wish to relate the resulting records or if the page is passed a query string of a record id that you would like associated. For example we have a careers page that lists job postings, each with a link to an application for the job that contains the id of the job posting to the application form so that when the application is created the job posting is associated with the record. Set Entity Reference On Save Yes or No. A value of yes indicates that an entity reference should be assigned when the form is saved, otherwise none will be set. Relationship Name The Relationship Definition Name for a given relationship between two entity types. Entity Logical Name The logical name of the reference entity. Target Lookup Attribute Logical Name Logical name of the lookup attribute on the target entity being created or updated. Populate Lookup Field If the lookup regarding the reference entity is on the form, checking this value will populate the field on the form with the value retrieved using the setting below. Selecting Query String requires a parameter name that must be provided in the query string of the URL to the form. This can be specified in the Query String Name field. If this parameter is the primary key then select Yes for the Query String Is Primary Key, otherwise select No and provide the logical name of the attribute on the target entity to query by specified in the Query Attribute Logical Name field. Selecting Current Portal User will retrieve the contact record for the current authenticated user. Selecting Result From Previous Step will retrieve the record created as a result of the step prior to the current step or from a specific step based on the step associated with the Entity Source Step. Reference Entity Step The Web Form Step record of a previous step to retrieve the entity created or edited in that step to associate it with the record for this current step. Query String Name Parameter name provided in the Query String of the URL to the Web Page containing the Web Form. Query String Is Primary Key Yes indicates the Query String value is the Primary Key value. No indicates the Query String value is an attribute type other than the Primary Key. Query Attribute Logical Name Logical name of the attribute to query the record. Show ReadOnly Details Indicates that a form should be rendered at the top of the page displaying read-only information pertaining to the reference record. Requires a Form Name. Form Name The name of the form on the reference entity that should be used to display read-only details. By default an Entity Form will allow for reading or updating of an existing record, or the insertion of a new record. However, you can easily enable and configure additional actions for records in an Entity Form as well (Delete, Activate, Deactivate, etc.). It is also possible to override default labels, sizes, and other attributes that will appear if there are actions enabled. These settings are found in the Additional Settings section of the entity form. By default, only Basic Settings are shown. You can select Advanced Settings to show additional settings. It is recommend to create a workflow instead of adding an Activate or a Deactivate button for out of the box entities having defined specific state and status code values that they require for their business processes. For example, Incident (status options), Opportunity(status options), Entitlements (status options). A managed form can be configured to display a map control to either display an existing location as a pin on a map or to provide the ability for the user to specify a location. See Add Geolocation. The form's map control requires additional configuration to tell it what the IDs of the various location fields are, to assign values to them or retrieve values from them. The Entity Form record in Dynamics 365 for Customer Engagement has a configuration section that defines these field mappings that you must specify. The field names will vary depending on the schema you have created. The address field in a read-only entity form is replaced with the map when geolocation is enabled. The Geolocation section is not visible in the German Sovereign Cloud environment. If a user has enabled geolocation by using a different form, it will not be displayed during rendering on portal.